Monday January 31st 1881 I helped some with the work in the forenoon, our new girl came. I did some work on my pillow case and hemmed some sheets for Hattie. Tuesday February 1st 1881 I helped all the forenoon about the work and in the afternoon took my work and went over to Wildes. The washing was done while I was gone. I helped get the supper and John Hatt and I went over to the opera house to an entertainment by the ladies of the Trinity Church. Weather chilly and cold. 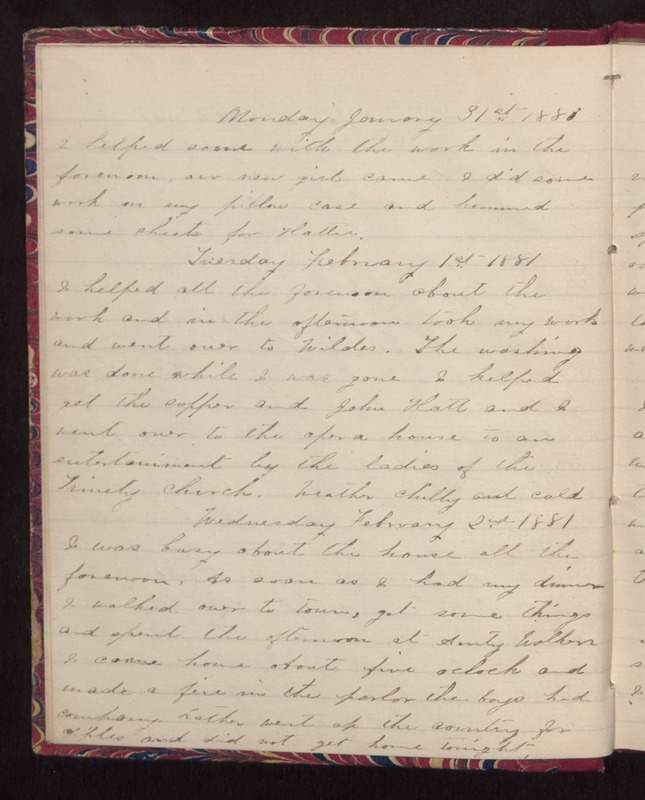 Wednesday February 2nd 1881 I was busy about the house all the forenoon. As soon as I had my dinner I walked over to town, got some things and spent the afternoon at Aunty Walkers. I came home about five oclock and made a fire in the parlor the boys had company. Father went up the country for apples and did not get home tonight.